Drones are just one tool in a larger counterterrorism strategy, one expert says. Washington (CNN) -- When the latest apparent U.S. drone strike was conducted this week against militants in Pakistan, the obvious question appeared to be: Did the United States get a "big fish" in the Taliban or al Qaeda organizations? But a U.S. counterterrorism official says that's now the wrong question to ask, and chances are those hit were not major players. He wouldn't discuss the specifics of the latest strike, but with the official backing of his bosses, he sought to explain how U.S. strategy has changed in the crucial effort to attack targets inside Pakistan with missiles fired from drones. The plan now is to attack a broader set of terrorist targets far beyond the original effort to strike and kill top al Qaeda leaders, the official said. The strategy originated not with President Obama but with the previous administration, he said. The more expansive target set was approved in the final months of the Bush administration in late 2008 but has been stepped up under the Obama White House, the official said. It is seen as a key strategy to help protect the growing number of U.S. forces in neighboring Afghanistan from insurgents operating in Pakistan's border region. 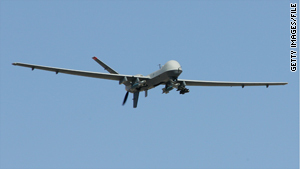 Drone-launched missiles are now hitting lower-level al Qaeda and Taliban personnel, camps, training areas, bomb makers, buildings and other targets in the remote region. "You've had an expanded target set for time now, and given the danger these groups pose and their relative inaccessibility, these kinds of strikes -- precise and effective -- have become almost like the cannon fire of this war. They're no longer extraordinary or even unusual," the official said. "The enemy, to be sure, has lost commanders, operational planners, weapons specialists, facilitators and more. But they've also lost fighters and trainers, the kinds of people who have killed American and allied forces in Afghanistan," he said. "Just because they're not big names doesn't mean they don't kill. They do. Their facilities -- where they prepare, rest and ready weapons -- are legitimate targets, too." Success in using the drones depends on larger intelligence efforts, said Frances Fragos Townsend, a former homeland security adviser to President George W. Bush and now a CNN intelligence analyst. Drones are just one tool in larger strategy, she said. It requires other tools -- intelligence, military and diplomatic -- to support it, she said. The administration has been sensitive to accusations that a large number of civilians have been killed since the stepped-up raids began. Statistics kept by the New America Foundation indicate that 30 percent of those who died in drone strikes in Pakistan since 2004 were not militants. The U.S. counterterrorism official disputed that, saying, "We believe the number of non-combatant casualties since this campaign intensified is under 30 -- those being people who were near terrorist targets, often by choice -- while the total for militants taken off the battlefield exceeds 500." The official said those figures are based not only on intelligence but also on visual observations before and after strikes. "The terrorists, who have a real incentive to spread stories of atrocities from the air, haven't done so because they can't do so," the official said. "They'd have to produce names, dates, photos and witnesses, the kinds of things you see almost instantly if the coalition makes a mistake in Afghanistan. But you just don't see that sort of thing coming out of the tribal areas. Instead, even press accounts from the area speak of militants cordoning off places that have been struck and of local and foreign fighters being hit."